February 17th, 2011 10:22 PM by Lehel S.
The down payments demanded by banks to buy homes have ballooned since the housing bust, forcing many people to rethink what they can afford and potentially shrinking the pool of eligible buyers. 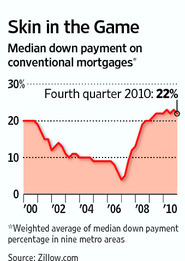 WSJ's Mitra Kalita reports banks are requiring prospective new home buyers to come up more cash for down payments. 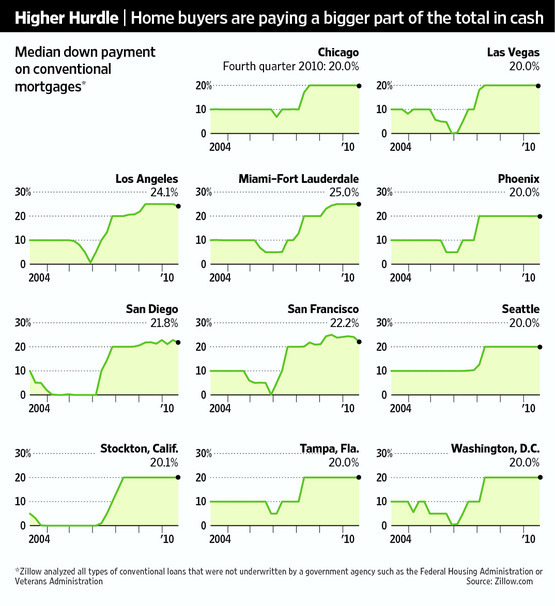 In nine U.S. cities, the median down payment is 22%. 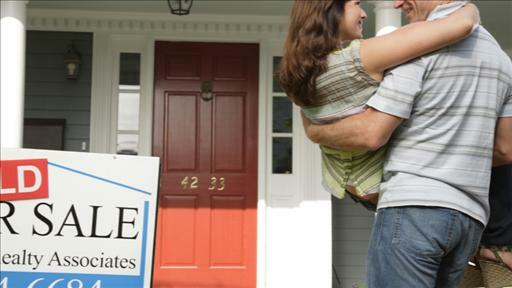 As housing prices drop, mortgage lenders are requiring larger downpayments on homes. Kelsey Hubbard talks to WSJ's Mitra Kalita about what the changes mean for consumers. Last week, the Obama administration called for gradually raising down payments to a minimum of 10% on conventional loans, meaning those that can be bought or guaranteed by mortgage giants Fannie Mae and Freddie Mac. And mortgage data show that private lenders are already pushing sharply higher the required down payments, mainly to mitigate their risk as home prices continue to fall. The median down payment in nine major U.S. cities rose to 22% last year on properties purchased through conventional mortgages, according to an analysis for The Wall Street Journal by real-estate portal Zillow.com. That percentage doubled in three years and represents the highest median down payment since the data were first tracked in 1997. The move to force home buyers to lay out more cash is driven mostly by banks, who have found that larger down payments discourage delinquencies by increasing the buyers' exposure to loss and reducing the impact of declining prices. Many home buyers placed little, if anything, down during the boom. A 2009 Federal Reserve Bank of St. Louis study concluded buyers who made smaller down payments were more likely to default during "unfavorable economic circumstances, such as a housing market slowdown or job loss." 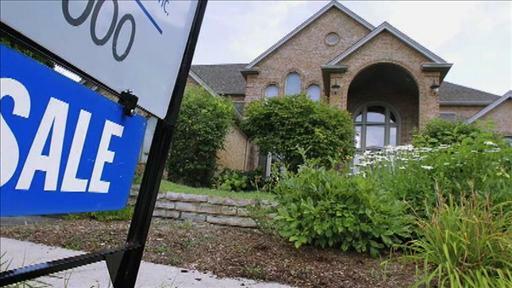 Higher borrowing costs and heftier down payments could send housing prices falling further. Last week, 30-year fixed mortgage rates rose to 5.05%, their highest level since April. "If there is a scenario where the government talks about raising down payments to 20% on conventional loans, you would absolutely crush the housing market," said Peter Norden, chief executive of Real Estate Mortgage Network Inc., an Edison, N.J., brokerage. For now, borrowers who can't afford such amounts are flocking to alternative programs, such as loans for veterans or those backed by the Federal Housing Administration, creating a parallel—and growing—nonconventional mortgage market for riskier borrowers and those who don't qualify for conventional loans. FHA-backed mortgages, which require 3.5% up front, made up about half of loans for home purchases last year, according to housing-research firm Zelman & Associates, but borrowers often pay higher interest rates and must pay private mortgage insurance, often driving their monthly payments higher. "There's no question that the tightening of criteria unquestionably prices households out of the market," said Zillow economist Stan Humphries. 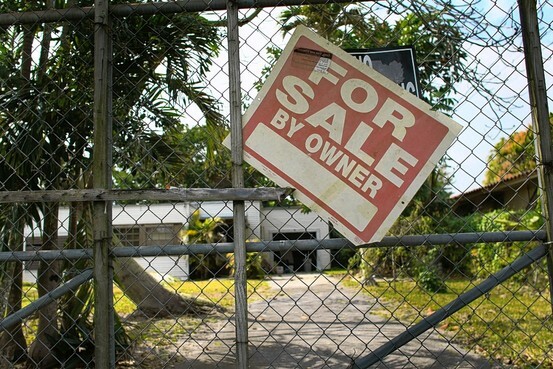 "The middle ground buyer is the one having to fight to get a conventional mortgage." Nikki Lavoie is among them. Six years ago, she and her then-husband bought their first home in Middletown, Del., through a veteran's loan, and have very little equity in the property. Recently divorced, Ms. Lavoie expects to make a small profit on the sale of the four-bedroom home, now under contract. That leaves her with a 5% down payment for a town house she plans to buy and share with her 14-month-old daughter. Once, that would have been enough. "A conventional loan…unless I had 20%, that is not even an option for me," said Ms. Lavoie, a 29-year-old who works for Delaware state government. Because the town house is in a rural area, Ms. Lavoie qualified for a United States Department of Agriculture loan, which requires no money down. She is saving what would have been her down payment for appliances and furniture. The median down payment hovered around 20% in the late 1990s and began to creep downward in 2001 in the nine cities Zillow analyzed: Chicago; Stockton, Calif.; Las Vegas; Los Angeles; Miami-Fort Lauderdale; Phoenix; San Diego; San Francisco; and Tampa, Fla. It fell as low as 4% in the fourth quarter of 2006, and in some markets came close to zero. Economists say it is no coincidence that those are the same markets sinking deeper underwater, meaning the value of homes is less than the debt owed on them. The mortgage industry has long grappled with the question of how much of a down payment is enough. As home prices rose at faster rates than Americans' incomes in recent decades, banks began to accept lower down payments to create greater affordability and spur home-buying. Federal Deposit Insurance Corp. Chairman Sheila Bair told an industry conference last month she supported minimum 20% down payments. Mr. Norden, of the Real Estate Mortgage Network, said a better solution would be to demand high down payments from riskier borrowers seeking conventional loans, while allowing those with better credit histories to qualify with a lower amount, such as 10%, down. 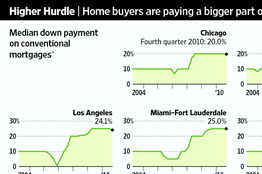 A house in Miami, where buyers are paying higher down payments. For banks, "the good news is lower leverage means less risk. The bad news: lower leverage means less activity," said David Berson, chief economist of the PMI Group. "A balance between the two is best." Another byproduct of higher down payments will be a reduction in what some families can afford—or a rethinking of whether they should buy at all, said John Courson, president and CEO of the Mortgage Bankers Association. "Many people will turn to the multifamily market," he said. "Or if you don't have whatever is deemed to be the appropriate down payment, the alternative is to be a renter while you accumulate that. You can't put a formula down that is going to fit every borrower's profile."